I've made some progress on the orcs. They were primed with Chaos Black spray. I then painted over the recesses where the base coat didn't catch well. Once I had a solid layer of black, I lightly sprayed brown over it. It helped in bringing out the details and it should making painting a bit faster since some paints (e.g. red) don't work well on a purely black basecoat. 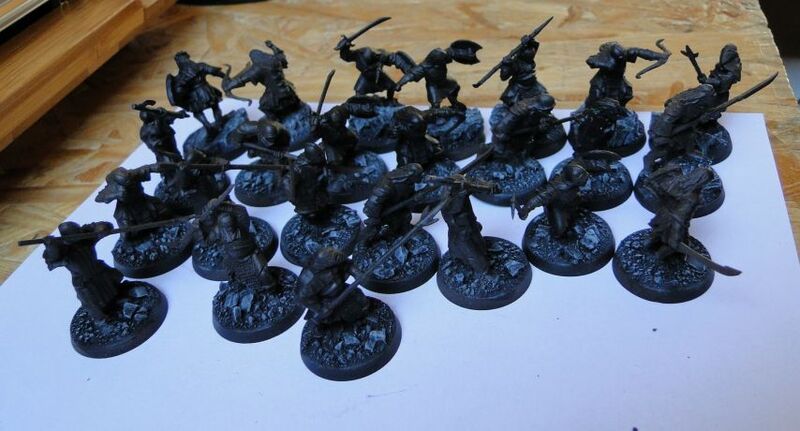 The bases should look like a scorched Mordor battleground once they're finished. I used two different types of basing grit and some sand to create what is supposed to look like random rubble. I will add scorched grass in the final stage as it tends to get flattened by varnish applied in spray. Thank you for the comment. I'm just wondering how it is that an artist like you who specializes in a completely different type of painting comes across this blog. I've never been to Fort Collins but I spent one holidays in Denver and have fond memories.